Image Comics is winning again with the announcement of the forthcoming Rueben Award-nominated webcomic by Mike Norton (he’s a great guy)—LIL’ DONNIE—to be collected into a hardcover edition and available this August. PORTLAND, OR, 5/22/2018 — Image Comics is winning again with the announcement of the forthcoming Rueben Award-nominated webcomic by Mike Norton (he’s a great guy)—LIL’ DONNIE—to be collected into a hardcover edition and available this August. Believe us, you’re going to love the LIL’ DONNIE, VOL. 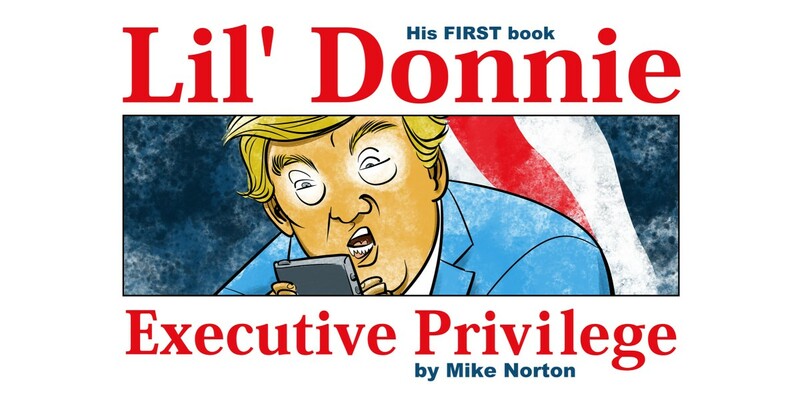 1: EXECUTIVE PRIVILEGE hardcover which collects the first 125 LIL’ DONNIE comic strips (winning!). This collection follows the timely and terrifying adventures of Lil’ Donnie, the worst president in the history of the United States of America. The incredible men and women who buy this collection will enjoy the first year of antics of a truly motley crew of weirdos and degenerates as they work (HA!) to make our world a better place… for them! So, let’s spend a lot of money on LIL’ DONNIE, VOL. 1 (Diamond Code JUN180066, ISBN: 978-1-5343-0977-7) which hits comic book stores on Wednesday, August 22nd and bookstores on Tuesday, August 28th. The final order cutoff for comics retailers is Monday, June 18th.